Chronic ankle instability can be a common and often debilitating problem resulting from multiple moderate ankle sprains or a single severe ankle sprain. The subsequent residual symptoms associated with chronic ankle instability may lead to multiple additional ankle sprains and possible secondary conditions such as arthritis, synovitis or tendon irritation/tear. In our practice, chronic ankle instability is one of the most common presentations and we have noted a triad of common problems associated with patients who have chronic ankle instability. These patients have often had multiple sprains with difficulty playing sports and chronic lateral ankle pain. Patients will often relate a single severe sprain or multiple periods of moderate sprain with activity. The triad we often note in our practice consists of ankle instability secondary to lateral ankle ligament tear, synovitis and possible scar tissue formation in the ankle with or without exostosis formation, and peroneal tendon tear. These findings are not always present together but often seem to be related to ankle instability cases. Over a period of over 100 cases, we have noted that most of these patients have had ankle instability for an extended period of time of over six months. Patients also relate multiple moderate sprains or one severe sprain that resulted in the onset of pain and swelling about the ankle. Patients also relate not having had proper treatment for the original ankle sprain at the time of the initial injury or injuries, and this led to chronic pain and instability. In order to understand the underlying problem, one needs to understand the cause of the problem. Emergency room technicians often render treatment with an Ace wrap and pain medications with no form of formal bracing or physical therapy. Patients will relate that the ankle never quite recovered from the initial injury and, over a period of months to years, the ankle has been getting more swollen and painful. They may also note that the ankle feels unstable. Often, there is also chronic inversion of the ankle with even normal activity due to the lack of proper proprioception and ligament laxity. The symptoms related to the triad of problems range from edema and pain in the ankle to posterior fibular pain to just a feeling of instability. However, what is most common is a sense of a chronic ache about the lateral ankle and lateral gutter with extended walking or sports. With extended periods of chronic instability, the patient may also note spurring of the anterior ankle with a grinding feeling. The physical exam often shows a swollen ankle, especially in the lateral gutter and anterior lateral ankle. There is a positive anterior drawer test and an additional talar tilt may be present as well. Physicians may also note crepitus in the anterior ankle with range of motion due to anterior spurring. The lateral ankle exam often misses the posterior and distal fibular region. In cases of peroneal tendon tear, there may or may not be a weakness of the peroneal tendons. In most cases, peroneal tendon weakness is hard to diagnose. However, there may be chronic pain along the peroneal tendons with increased pain to pressure especially on the distal posterior fibula and just distal to the tip of the fibula along the peroneal tendons. Diagnostic studies require plain film radiographs for a check of osteochondral lesions, bone spurs and possible avulsion fractures about the ankle. One must also check the position of the talus within the ankle mortise. Radiographs are of little use in the assessment of the ligament and tendon structures. We most commonly use magnetic resonance imaging (MRI) for an adequate check of the ankle. Contrast is not necessary unless there is a high suspicion of an osteochondral lesion. 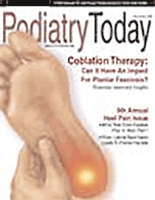 For these patients, podiatrists should order a MRI with and without contrast. The MRI evaluation will often show tears of the lateral collaterals, synovitis or possible scar tissue within the ankle, and longitudinal split tears of the peroneal tendon(s). It is rare to note a tear of the peroneus longus or a complete peroneal tendon tear. What is most common is a longitudinal split tear of the peroneus brevis posterior and plantar to the distal fibula. In rare cases of gross lateral ankle weakness of the peroneus brevis, a complete tear is possible. Osteochondral lesions may be present but we do not always treat them unless they are painful. I have not found conservative care to be of much help in cases of chronic instability. In most cases, the unstable ankle has been present for an extended period of time and the secondary complications, including synovitis, tendonitis or tendon tear, often will not resolve well enough with physical therapy. I have found that the synovitis and tendonitis improve but the underlying instability of the ankle results in the return of pain after therapy stops. Surgical treatment of chronic ankle instability also depends on the secondary findings. In the case of the aforementioned triad of synovitis, tendon tear and instability, one would treat the three problems at the time of the initial surgery. Begin the surgery with an ankle arthroscopy. Utilizing arthroscopy enables you to treat the synovitic tissue in the ankle joint and also remove any scar tissue or fibrous bands within the joint. Often, diagnostic testing does not visualize fibrous bands and scar tissue in the ankle joint. Arthroscopic treatment of osteochondral lesions is not necessary or suggested unless they are symptomatic. Exercise caution when drilling lesions. Also be careful when placing the patient in a cast after surgery. The casting is necessary to facilitate stability following ligament and tendon repair, but keep in mind that scar tissue may form in the ankle. I have often delayed treatment of the osteochondral lesion as it may not be problematic after stabilization of the ankle. In the case of severe synovitic tissue, it is best to perform ablation of the hemorrhagic regions with a cauterizing ablator. Following arthroscopic debridement, make a lateral hockey stick incision posterior to the fibula and running anterior to the plantar fibula. Free the extensor retinaculum and protect it for imbrication. Open the peroneal sheath and check both peroneal tendons. The tendon tear very often involves the peroneus brevis tendon posterior to the fibula at the distal and plantar aspect of the fibula. This may be due to the stress of the tendon on the posterior fibula at the time of the initial injury or chronic strain of the tendon on the posterior fibula as a result of the unstable ankle. Use a cautery device to debride the torn region of the peroneal tendon, which is commonly a longitudinal split tear. Then debride the edges of the tendon and use a running suture to suture the tendon on itself. I prefer to use a 4-0 or 5-0 nylon with a running baseball stitch for my tendon repair. Then observe the lateral collateral ligaments. In most cases, the ligament has a central tear region. In certain cases, though, the ligaments are avulsed off the distal fibula often with an avulsion fragment present. In either case, the distal and anterior fibula is rough and one should repair the ligaments in a “pants over vest” fashion for imbrication. I prefer to use a bone anchor if there is insufficient ligament near the distal and anterior fibula. I have not noted a great deal of difference in stability whether one uses a bone anchor or not. Following the lateral ankle ligament imbrication, close the peroneal sheath and also imbricate the extensor retinaculum in a pants over vest fashion. Then close the deep tissue and skin, and apply a cast. I usually keep patients non-weightbearing for three to four weeks and then transition them to weightbearing for three weeks in a cast for a total of six to seven weeks of casting. I subsequently transition the patient into an ankle brace and have him or her begin physical therapy for range of motion and proprioception. The patient wears an ankle brace for one month at all times and for a total of three months following cast removal. With a thorough examination, proper diagnostic testing and appropriate surgical consideration, one can achieve excellent longstanding outcomes with limited risk of potential complication.